While looking at different schedules for the 2013 season, I couldn’t help but notice that Oregon’s is (at least on paper) really “manageable.” Yes, I am using the word manageable instead of joke. After looking over their schedule, is there any reason the Ducks’ shouldn’t go undefeated (or 12-1 at the worst)? I know, Chip Kelly left for the NFL. However, I don’t think that will hurt the Ducks as much as you might think, at least not this coming season. Why? Because the Ducks return a lot of players and have retained a large part of the coaching staff. In other words, Kelly will be the only missing ingredient in 2013. I have heard that part of the reason Kelly had left Oregon was that he felt there was nothing left for him to accomplish there. This seems like a really odd comment for someone to make considering the Ducks have never won the BCS National TItle (and probably should have, considering how good some of the recent Oregon teams have been). Had Kelly stuck around for 2013, he could have easily set his sights on the crystal football with this schedule. The Ducks’ first two games are against Nicholls State and Virginia (both of which should be wins). Next, the Ducks face Tennessee at Home. Tennessee has done nothing but struggle over the past several seasons, and will be breaking in a first year head coach. I don’t think there is anything to fear with the Vols, and when the game is over, Oregon should be 3-0. The Ducks then get a bye-week, followed by Cal, Colorado and Washington. Cal will have a new head coach and Colorado hasn’t shown much signs of life lately. As for Washington, while there has been a few sparks, nothing has yet materialized for the Huskies and I can’t consider them a threat until they show some consistent success. Next up the Ducks get Washington State and UCLA. The Ducks should be 6-0 heading into the game with Washington State, and unless Mike Leach is able to work some magic, I don’t see the Cougars traveling to Oregon and pulling the upset. UCLA, on the other hand, could be a tougher opponent for the Ducks, but all things considered equal, the Ducks are still the better team (by a lot) and really shouldn’t have a problem handling the Bruins. So at this point, the Ducks should be 8-0 with a bye-week before they play Stanford. Unfortunately for the Ducks, they have to play at Stanford. The Cardinal has been a problem for Oregon over the past couple of seasons, so this could be their first real test. Worst case scenario, the undefeated season comes to an end in Palo Alto, CA and the Ducks head home with an 8-1 record. The Ducks should rebound nicely against Utah and Arizona, landing the Ducks at 10-1 as they prepare to face off with Oregon State. 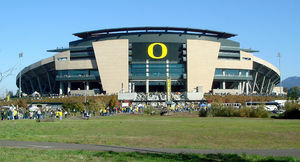 While the Beavers had a nice 2012 season, there is no reason they should be able to defeat the Ducks at Autzen Stadium. The only thing left at this point is the Pac-12 Championship game. If Oregon isn’t kept out of this game due to their loss to Stanford, they will most likely be facing either USC or UCLA in this title game. Regardless, Oregon should win the game/conference and prepare themselves for a BCS bid. At 12-1, Oregon will have a real shot at getting into the BCS Championship game, however, if they manage to get past Stanford on November 7th, they should be an automatic to the BCS Championship. In other words, Oregon should win every game on their schedule in 2013, with Stanford being the only real question mark. However, even Stanford should be a very win-able game for Oregon. This entry was posted in 2013, Oregon, Pac 12 by Travis Normand. Bookmark the permalink. Nicholls State? I’m guessing Charleston Southern was booked that weekend?